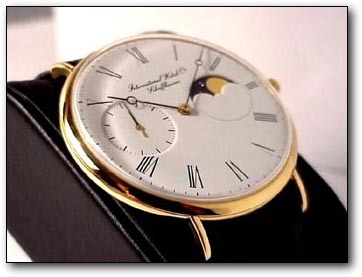 This watch, first made and sold in 1981*, was the eventual inspiration for what we know today as the Portofino line of IWC watches, introduced in 1987. At 46mm in diameter, and 51mm lug-to-lug, this watch is as thin at 6mm as it is large in circumference. It is not a watch for the faint of heart. 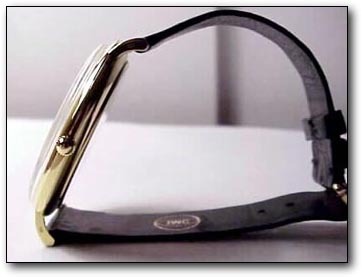 In fact, I suspect this watch was originally made for the purpose of seeing just how it might turn out. It indeed turned out beautifully and is, without question, a serious collector’s item. 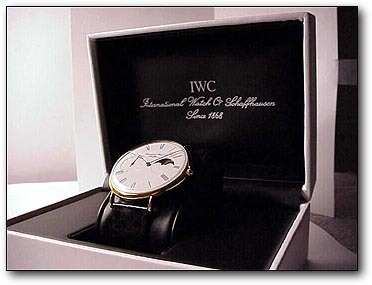 Despite its price, IWC goes to no extraordinary expense to package this rarity. Its boxes are the same as all IWC’s with the possible exception of the Da Vincis and Grand Complications whose packaging I have never seen. The pillow is obviously wider to accommodate its size, but at a U.S. MSRP of $14,000, one might expect it to have its own special packaging. 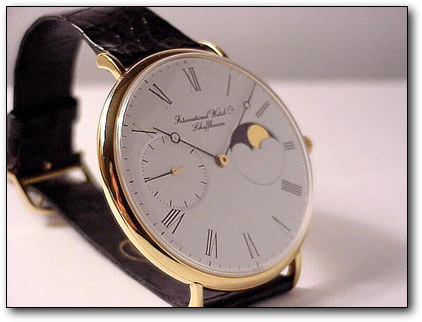 Photo 2 – At this angle the moon is visible as is the sunken seconds dial and the delicate Breguet hands. Photo 3 – at 6mm this is a thin watch by many standards but remarkable for a watch this large. The case, in 18k yellow gold, is a two-piece flange really, that holds the movement and dial sandwiched between the front acrylic crystal and the sapphire exhibition back. Remarkably thin and flat for its size, it is surprisingly comfortable on my wrist, if not so large as to be somewhat distracting. When it’s on, one has a tendency to look at it frequently. This is not a watch to wear while driving at high speeds in heavy traffic. It can also be read from across a crowded room, which I find aggravating, since it tends to attract ‘ner-do-wells and heads of charitable trusts. Photo 4 – so large, it can almost sit up and wind itself. The dial on this watch is gorgeous and one of its most striking features. Here, I make the assumption that it is indeed enamel. It certainly looks to be. I have asked Mrs. Marlene Weideli at IWC in Switzerland so many questions about this watch that I was almost too embarrassed to go back and ask this. I just simply forgot to confirm with her what I assumed to be the case. While on the subject of IWC, they would tell me very little about this watch, and nothing regarding the production quantities. Mrs. Weideli would only say that “it had not been ten years yet”, meaning, I assume, from the date of its last manufacture. We now know it is no longer available as a catalog item. From what I can tell, mine was made in 1997 and perhaps among the last to ever be produced. We know from the catalog that final assembly of this watch “comes a full one-and-a-half years after receipt of the customer’s order”, indicating that a great deal of handwork and craft goes into each piece. Either that, or the watchmaker they assigned to this model is very slow! While this was a difficult watch to photograph in terms of picking up the gold moon, it was also my first attempt at using a digital camera. The shots obviously are not great but unfortunately I’ve seen none better of this watch. My objective was to shoot it in as many angles as time allowed – I borrowed the camera – even if the results were less than professional. 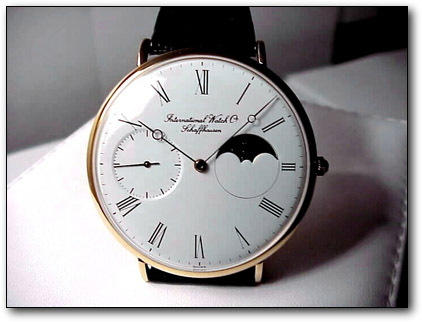 Photo 5 – straight on, the gold moon disappears but the beautiful Breguet hands, large script, and Roman numerals join together to complete the dial.